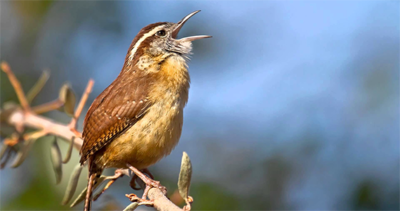 Attract wild birds to your backyard during winter! 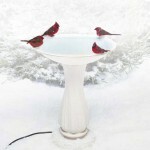 The Backyard Naturalist is letting you in on a little secret…Heated bird baths!!! We’re not talking about jacuzzis here… Just dependable and accessible water sources that do not ice over. Water is critical for wild bird survival in winter. See Wild Birds, Winter and Water for more info. Heated bird baths and de-icers are indispensable to help you maintain your backyard bird habitat when temperatures are below freezing. And the temperature is dropping! Get ready!!! 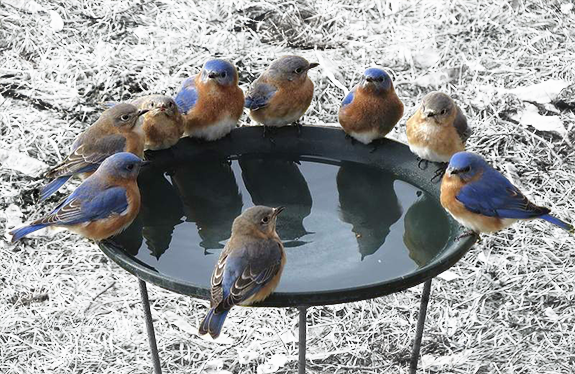 Winterize your bird bath! Add a de-icer. Have a bird bath already? Add a de-icer. If your bird bath is made of concrete or ceramic, our area’s winter weather patterns of ‘freeze and thaw’ can cause cracks that will destroy it over time. So, to prevent cracking, place a de-icer in your bird bath top or you will need to put it away for the winter to protect it. Substitute with a bird bath made of sturdy plastic, granite or metal. You will still need a de-icer to keep water unfrozen and accessible to the birds. We recommend the ‘Heated Rock De-Icer’. 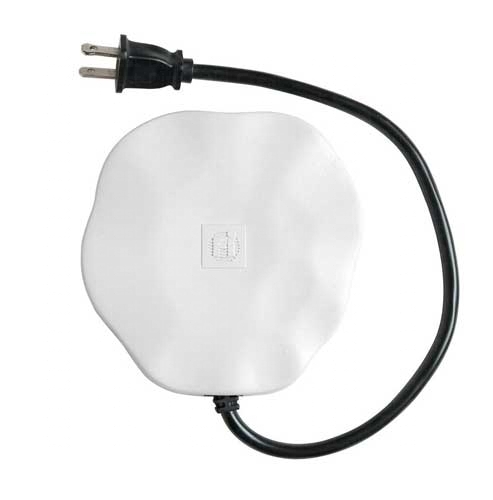 It has a thermostat and activates when temperatures drop. Choose an all-season bird bath with an integrated heater! A pedestal bird bath with an integrated self-regulating, thermostatically controlled heater is a practical addition to your backyard winter landscape and a great gift for all bird lovers of all ages! Bring the action CLOSER when you’re stuck inside during a dreary winter day. We have definite favorites, including deck-mounted, pole mounted and hanging bird bath designs that offer flexibility in placement. Stop by the store and we will help you find the best option for your backyard and budget. P.S. 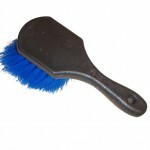 Keep our bird bath brush handy for easy cleaning!